Every school in the Ridgefield School District held a Veterans Day assembly to honor our fallen veterans and those still serving. Each assembly was unique--performed largely by the students themselves. South Ridge Elementary opened their assembly with a song titled Thank You Soldiers performed by third- and fourth-graders, followed by a short talk from guest speaker, Robert Anderson, a veteran who served in the Army and Army Reserve and parent of two South Ridge students. A slide show honored veterans from families of South Ridge students and staff. 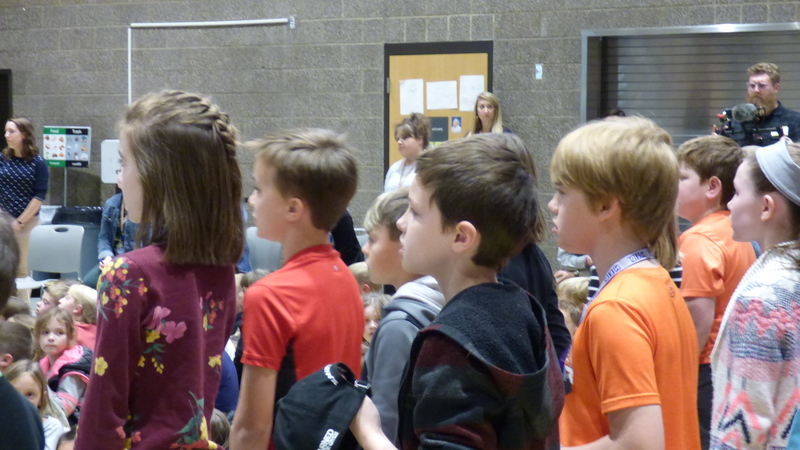 South Ridge students sing Thank You Soldiers at their Veterans Day Assembly. At Union Ridge Elementary, each grade participated. Musical performances included a song in sign language and patriotic songs along with poetry readings and a slide show. 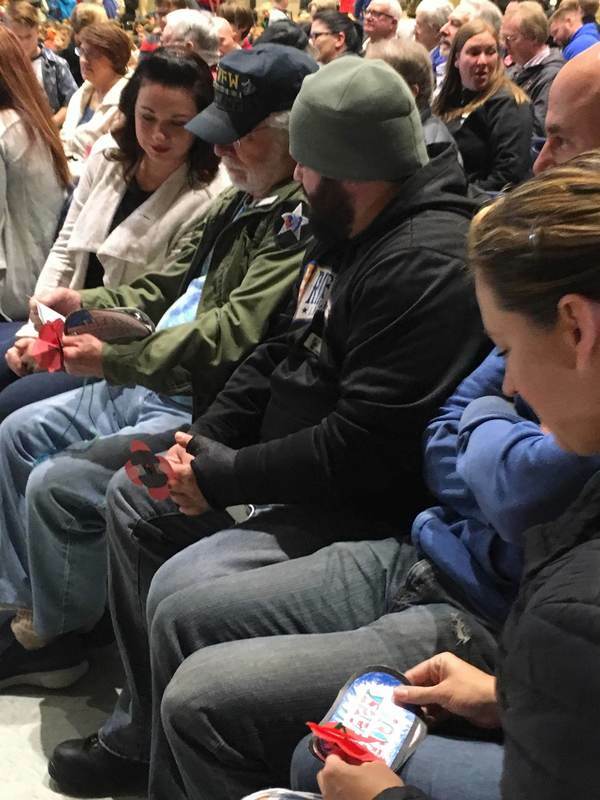 Handmade poppies of remembrance and thank you cards were distributed to veterans in the audience, and the Ridgefield American Legion led the presentation of colors. 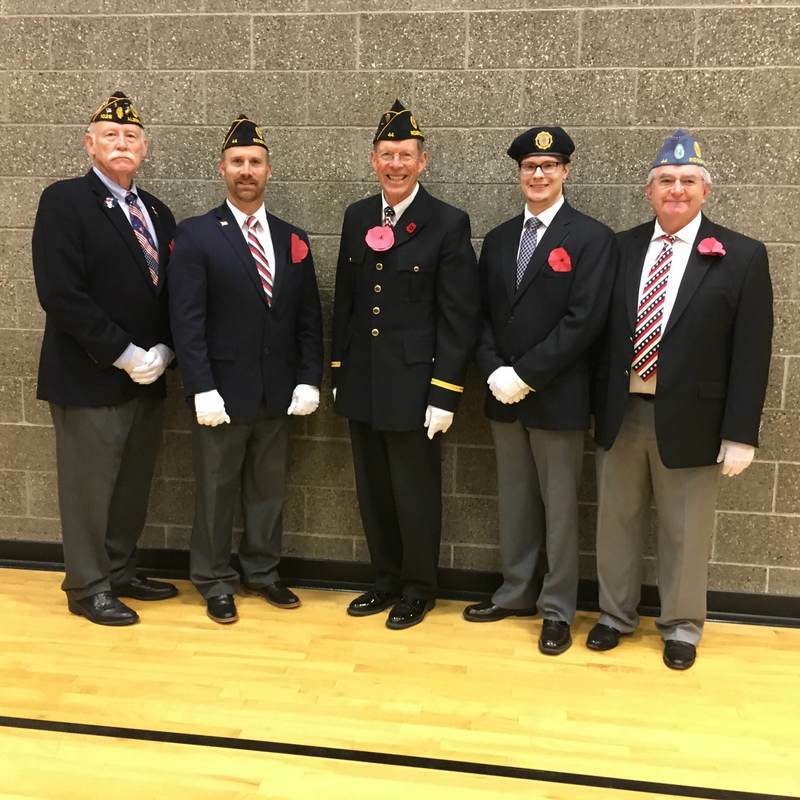 Ridgefield American Legion at Union Ridge's assembly. Veterans read notes of thanks from Union Ridge's second graders. 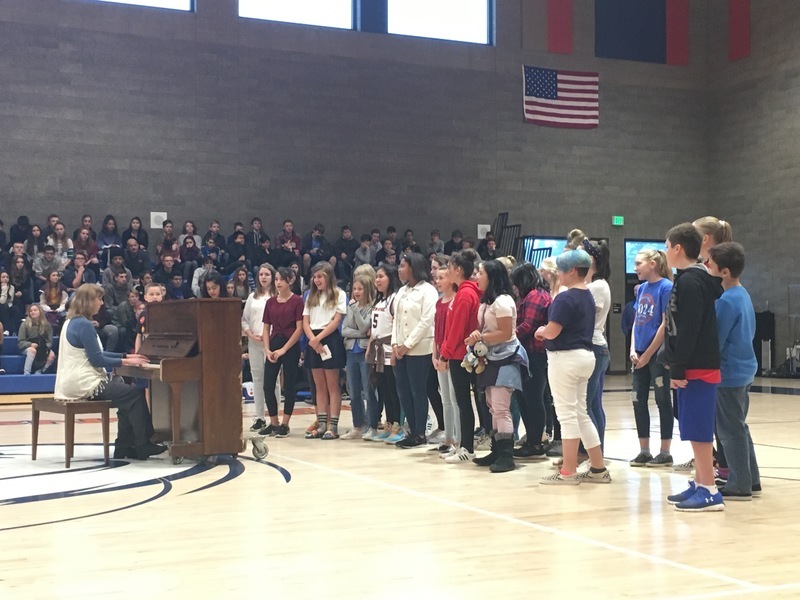 Sunset Ridge Intermediate School’s assembly presented patriotic songs from the chorus and the national anthem sung by a student. The poem In Flanders Fields was read, and the band performed two group numbers. Thank you cards were distributed to veterans, who were then asked to introduce themselves and offer advice to the students. 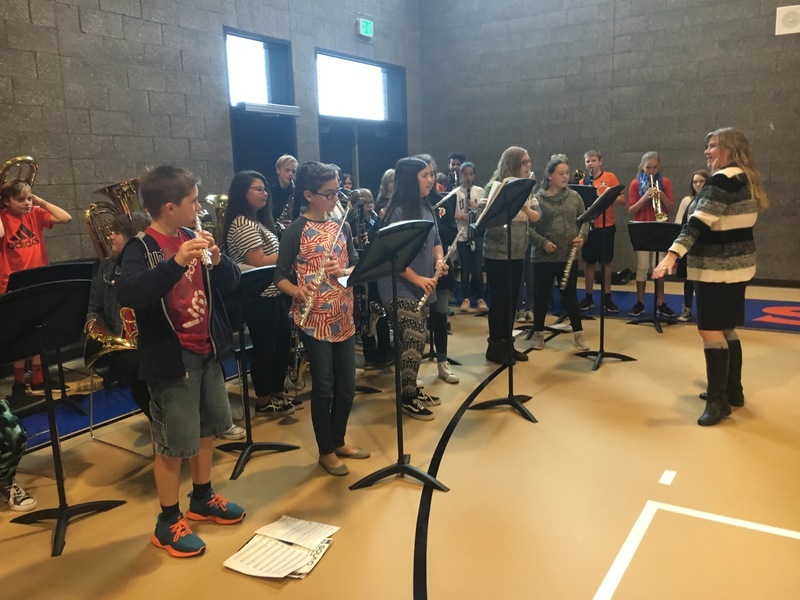 Sunset Ridge Intermediate School band performs patriotic songs. At View Ridge Middle School, the Lewis and Clark Young Marines led the presentation of colors. A flute duo performed the national anthem, and the chorus performed. A student essay was read thanking veterans for their service. In memory of fallen, missing or imprisoned military service members, the Missing Man Table ceremony, a symbolic single place setting at a table, was presented. Finally, a slide show displayed photos of students’ family members who had served. 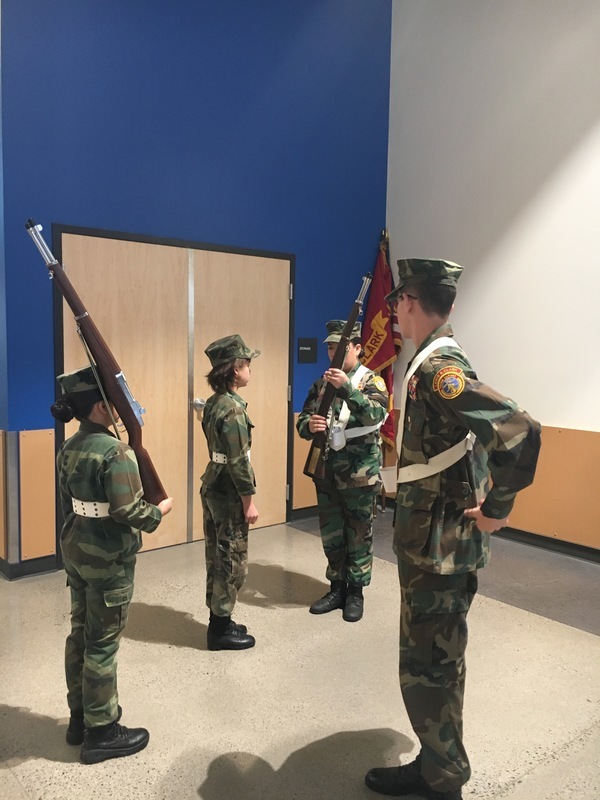 Lewis and Clark Young Marines practice before presenting the colors at View Ridge's assembly. View Ridge Middle School Chorus performs. 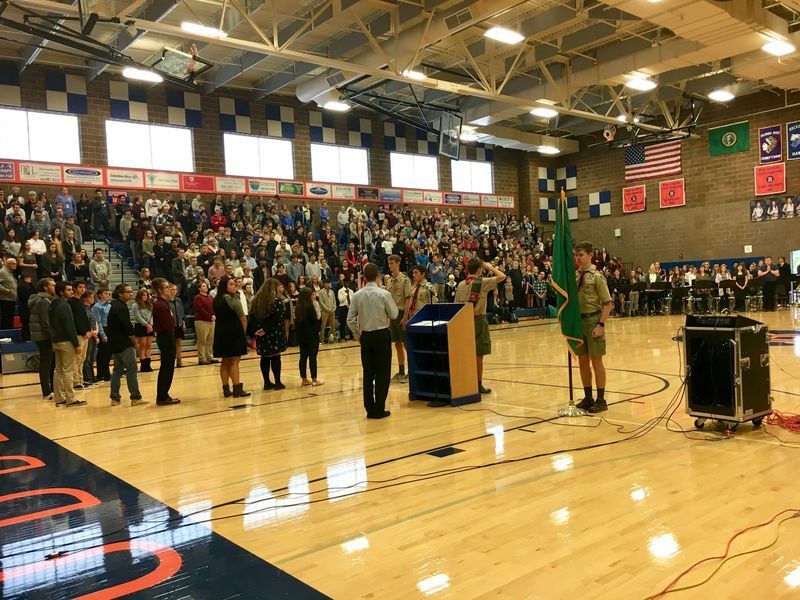 Ridgefield High School featured a presentation of the colors by the Boy Scouts. Speeches were given by a veteran and by the event’s student emcee. The high school choir performed the national anthem, and the symphonic band led patriotic songs. A video remembering our soldiers concluded the assembly. Boy Scouts lead the presentation of the colors at Ridgefield High School's assembly. These moving ceremonies reminds us all to thank the veterans in our lives and to honor those who have passed. Many thanks to the students and teachers who helped commemorate this special day.